World Armwrestling League president Steve Kaplan calls partnership with Turner and B/R Live "a match made in heaven"
An interesting aspect of sports media companies’ push into over-the-top streaming services is the opportunities that can pose for some less-prominent sports that might not necessarily work as well in a linear television deal. We’ve seen that with some of the content featured on ESPN+ (some was already available through free streaming service ESPN3 and on ESPN in particular circumstances, but there’s even more now), with moves like Barstool Sports’ Rough N Rowdy pay-per-view fighting events, and now with some of the stuff featured on Turner’s new streaming service, B/R Live (which is free to try until June). 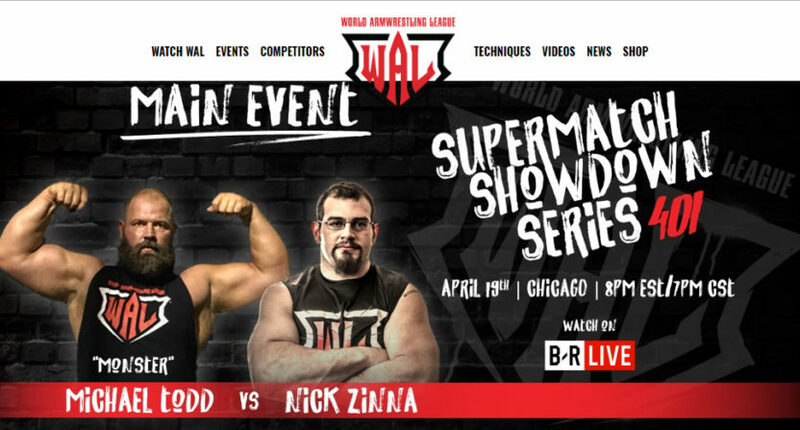 One new league there is the World Armwrestling League, which will have five two-hour WAL Supermatch Showdown Series events featured on B/R Live, beginning Thursday night (8 p.m. ET) from Chicago and continuing May 17, June 14, July 19 and August 9 from Baltimore, Cleveland, Norfolk and LA respectively. Those events will feature some of the top male and female armwrestling athletes in the world competing in best-of-five matches, with over $250,000 in prize money distributed across the series and a championship Sept. 5 at Turner’s arena in Atlanta. WAL president Steve Kaplan, previously known for his work as an entrepreneur (particularly with SCA, which he built and then sold to Redskins’ owner Dan Snyder’s Snyder Communications), author and speaker, spoke to The Comeback recently about the WAL, and about why Turner and their new streaming service is the perfect partner here. Kaplan got involved with the WAL in 2014, and he said he was brought into thanks to, of all things, a trip to Afghanistan to speak to members of the U.S. armed forces. He said the way those competitors found common ground in armwrestling was impressive, and it convinced him there was something here that deserved more exposure. Since Kaplan became involved, he said the focus has been on making the sport more accessible to a wider audience of sports fans. Some of that came through extensive prize money, and some came through having matches seen on ESPN’s streaming and international platforms. Kaplan said the sport is more viewer-friendly now, and it’s a great fit for a B/R Live audience he expects to be mostly young and male. Kaplan said his past experience building companies has given him some tips on what to do and what to avoid. And he added that his experience working on the global business stage is important for where he sees WAL going. Kaplan said the way WAL has brought competitors together is something he sees as a key selling point, and something that’s going to help it grow further. The WAL Supermatch Showdown Series on B/R Live begins with WAL 401 from Chicago Thursday night at 8 p.m. Eastern. Subsequent events include WAL 402 on May 17 in Baltimore, WAL 403 on June 14 in Cleveland, WAL 404 on July 19 in Norfolk, VA, and WAL 405 on August 9 in Los Angeles, with all of those events beginning at 8 p.m. ET. The championship will be Wednesday, September 5 in Atlanta. More information is available on the WAL website and B/R Live’s website. B/R Live is free to watch through June.